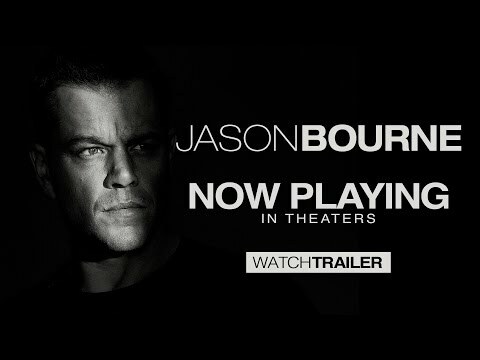 Synopsis: Bourne is drawn out of hiding when new evidence regarding his past comes to light. Jason Bourne marks the return of Matt Damon (Elysium, Interstellar) return to the franchise after a departure which saw Jeremy Renner briefly take up the reins for The Bourne Legacy. He’s reunited with British director Paul Greengrass, whose participation was in fact a condition upon which Damon’s return depended. You’d expect nothing short of excellence from such cinematic heavyweights, and in terms of pacing and action, excellence is what you get; but in too many other areas Jason Bourne, like the actor who plays him, is starting to look just a little bit jaded. The movie opens with Bourne’s narrative declaration of total recall – so do you think that spells the end of the franchise? Well, that all depends on whether you believe it’s a good idea to roast a goose that regularly spits out oval-shaped nuggets of gold. Bourne might, as he says, remember everything, but that doesn’t mean he knows everything; and so begins a trot around the globe which feels like its fuelled more by a sense of genre duty than relevance to the plot. The Greek-Albanian border, Reykjavik, Washington and Athens are all visited in short order as we’re introduced to the key players, most of whom are new to the franchise. One familiar face making a return is Nicky Parsons (Julia Stiles – 10 Things I Hate About You, Silver Linings Playbook), whose hacking of the CIA’s files from an underground internet cafe in Iceland has turned up some files relating to Bourne and his late father (Gregg Henry – Scarface, Ballistic: Eckhart vs Sever). Unfortunately, Nicky spent a little too long rummaging around in the Agency’s deepest drawers and attracted the attention of Heather Lee (Alicia Vikander – Ex-Machina, The Man from U.N.C.L.E. ), a cyber-ops agent who alerts CIA director Robert Dewey (Tommy Lee Jones – Criminal, Mechanic: Resurrection). After making Lee a part of his team, Dewey leads a search for the architect of the breach, and places an operative known only as Asset (Vincent Cassel – Child 44, Tale of Tales) on standby to exterminate them once they are located. With a bewildering array of high-tech surveillance technology at their disposal, it’s not long before Dewey and his team catch up with Nicky just as she’s rendezvousing with Bourne in, of all places, the middle of a riot in Athens. Nicky doesn’t survive that meeting, but has time to deliver a key to Bourne which sends him on a quest to find just why the CIA has a file on him and his father. Given his excessive use of palsy-cam, an outdated technique which ruined many otherwise decent movies of the 1990s, we can only assume that Greengrass has shares in Pfizer, or whoever it is that now makes Anadin. His unrelenting – and needless – use of the technique, accompanied by an unceasing musical score, becomes a major distraction that severely diminishes any enjoyment gained from an otherwise serviceable action thriller featuring a strong cast of talented actors. Damon is as dependable as ever. Suddenly, middle age has begun to make inroads on what seemed like his perpetual youthfulness, so that Bourne almost looks like he might have spent the past few years scratching out a living on the underground bare knuckle circuit. Tommy Lee Jones could never be described as boyish, even in the very earliest days of his career, and now, at the age of 70, he looks as if his face is slowly melting. Nevertheless, his curmudgeonly manner is always welcome on our screens, and is so strangely reassuring that we never really want to see any kind of modulation in his performance. Another strong presence – although criminally under-used here – is the French actor Vincent Cassel, whose charisma is more attuned to criminal roles, but is given too little to do to justify his presence. Although too young for the role, Alicia Vikander also does well as the ambitious and morally ambiguous Agent Lee. Jason Bourne is slick and noisy and fast, and is filled with plenty of action – most of which is, of course, spectacularly improbable – but the franchise is also starting to feel a little opportunistic, and the suspicion that it’s on the wane is impossible to ignore.